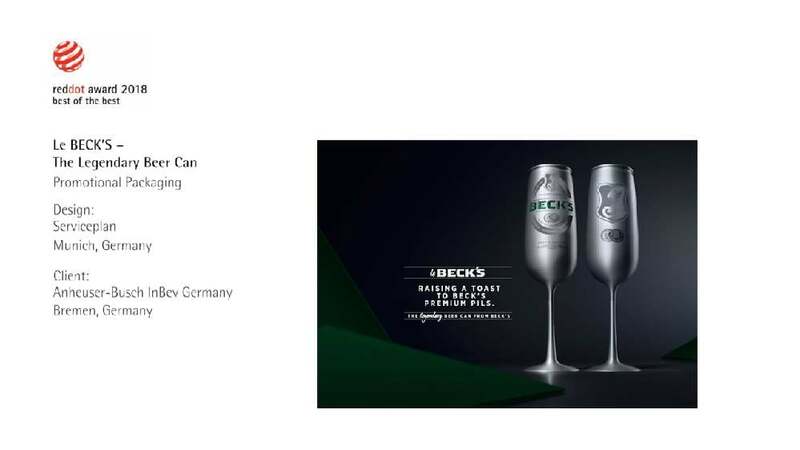 Famous for its premium beer made of carefully selected ingredients and a distinctive flavour, Beck’s brewery launched a special limited-edition series. To overcome the stagnant beer market and the image problem of canned beer, the idea was to revise the can as the most immediate touchpoint itself. Inspired by superior drinking cultures, the shape of the premium Pils has been transformed into a carefully crafted beer can in the form of a champagne flute. Made of brushed aluminium and finished with multiple laser and analogue engravings, the can not only breaks free from the familiar form by adopting the appearance of a beer can and a champagne flute at the same time, it has also acquired a new haptic quality. Designed for events and venues where people usually do not drink beer, such as at galleries for instance, the unusual design of the limited edition invited the audience to a novel drinking experience and the custom of “clinking beer”. The response to this edition was positive and even overwhelming, emphasising the premium image of the beer brand perfectly. This promotional packaging convinces with the clever idea of transforming the familiar beer can into a classic champagne flute. The shape alone immediately enhances the image of the beer, whose premium perception is further emphasised by the refined materiality of the can. Establishing an entirely novel beer drinking form, the brand once again has communicated its high quality standards.